Sunday sale: Get the world's best entry-level DSLR for almost half price with these fantastic Cyber Monday deals. Black Friday might have been a few days – but it seems nobody's told the retailers. We've just spotted a brilliant series of Cyber Monday deals on the excellent Nikon D3500, a camera widely thought to be the best entry-level DSLR in the world right now. Available at Adorama, these Cyber Monday weekend deals are perfect for anyone thinking about getting into photography. So what have we found? Well, the cheapest deal sees the D3500 bundled with an AF-P DX NIKKOR 18-55mm f/3.5-5.6G VR lens, for just $396.95. That’s a fantastic $100 discount on a DSLR that was already great value for money. You’ll make the biggest saving with Adorama’s middle-tier offer, though. If you can find another $100, you'll be able to take home the Nikon D3500 with two great lenses for only $496.95 – down from $846.95. This is the option we'd recommend, if you can stretch your budget that far. With two lenses, you've got a lot of flexibility straight out of the box. The D3500 is a refreshed version of Nikon’s ever-popular Nikon D3400. It delivers ultra-sharp photos and videos, and faster continuous shooting than its rival, the Canon EOS 750D/Rebel T6i. 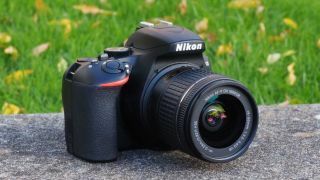 And it’s perfect for beginners, offering a lightweight, responsive and extremely easy-to-use way into DSLR photography. With $100 knocked off the usual price, this bundle offers brilliant value for money, and would make for a cracking Christmas present.